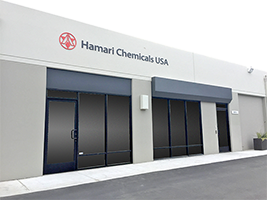 Hamari USA (SDRC) | Hamari Chemicals, Ltd.
Hamari Chemicals, Ltd. expanded its global pharmaceutical business presence with Hamari Chemicals USA Inc. San Diego Research Center. This company is primarily entrusted with small scale synthesis to provide regional services to the North American market. The company strengthens market development and sales activities in the North American market and offers both toll & contract manufacturing as well as full-time-equivalency services to customers who demand regional contracts for the preparation of molecular compounds.